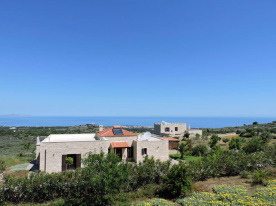 Stone built luxury villa constructed 2012 in Atsipopoulo Rethymno. It offers panoramic views of the White Mountains, the Akrotiri peninsula and look out over the Aegean sea - simply a magnificent panorama. The property is devided in 2 levels which are connected by a large wide staircase with 5 steps and a beautiful arch. At the first level is a spacious living room and a dining area along with a high quality fitted kitchen. On the second level there are two bedrooms each with a private bathroom. The villa has central heating and is perfect for all year round living. Outside there is a beautiful large pool and large terrace shaded with a pergola. There is also a BBQ area and a shaded car port. The villa sits on a 2.000 sq.m property and the garden area is created in the Mediterranean style. This villa is situated on a hill above Atsipopoulo village. 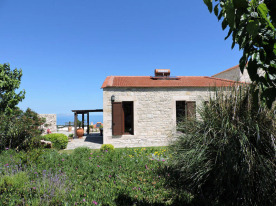 It is build among other stone built houses in an area with magnificent views of the sea and the Cretan nature. In the village of Atsipopoulo you can find restaurants, a bakery, a supermarket, a pharmacy and various other shops.